Diane Burket has been recording Voice Overs for 25+ years. She is a Union member of SAG/AFTRA (Screen Actors Guild / American Federation of Television & Radio Artists). For over 20 years, she has taught Voice Over classes to private individuals and large classes. 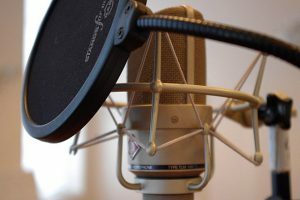 With high speed internet and a Home Recording Studio—just about anyone can record International Voice Overs from home. 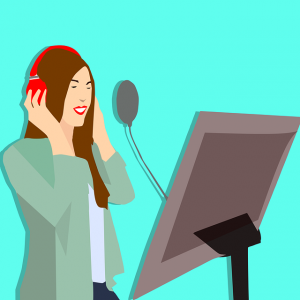 In addition to training Voice Actors, Diane also trains Corporate Executives who need help with their vocal presentations. Explore scripts focusing on understanding different genres and how they communicate to audiences. You will learn to employ basic acting techniques. Accents, speech habits, and proper breathing techniques are issues that will be addressed. You will need a home studio from which to audition and record jobs for clients. You don’t have to become an expert in audio engineering, but there are basics to get under your belt. Talent Agents & Casting Agents….and More! I teach from my Home/Studio in Warrenton, Virginia. All ages of serious students. All levels. Before calling to discuss classes, please buy this book and read it. Here’s the link. 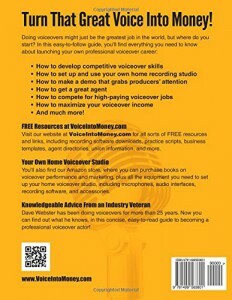 The "Go To" book for Voice Overs. Everything you need to know about equipment, required skills, agents, $$$, recording…& More! 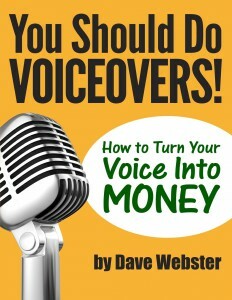 Finally—A Voice Over book that covers everything! I've been a professional Voice Over for 25+ years. Every week, I get a call or an email (usually from strangers) asking about how to get into the V/O business. From now on, I'll save my breath and just have them purchase this book! Dave Webster details step-by-step how to set up a home studio—pictures, prices, brands, software, hardware, etc. Making demos (very important), websites, practice scripts, how to edit, how to find work. I can go on….but if you're serious about getting into the V/O business….or you're in it and want to get better at it—BUY THIS BOOK! It's easy to read. Factual. Updated. Webster even has a website that is jam packed with helpful links, recommended products, downloads for practice scripts, etc. It’s a great companion to the book.